Moel Arthur lies in the community of Llandyrnog in the county of Denbighshire. It is located at Ordnance Survey national grid reference SJ1425066080. The mine is recorded in the CPAT Historic Environment Record as number 18126 and this number should be quoted in all correspondence. Ludlow Rocks of the Clwydian Range. 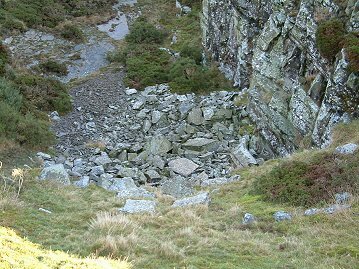 Disused levels are located on the western slopes of Moel Arthur at SJ14256608. These are the 19th century trials for gold, although no mineral evidence remains. A contemporary Mining Journal reports crushing and washing machinery being installed on site.